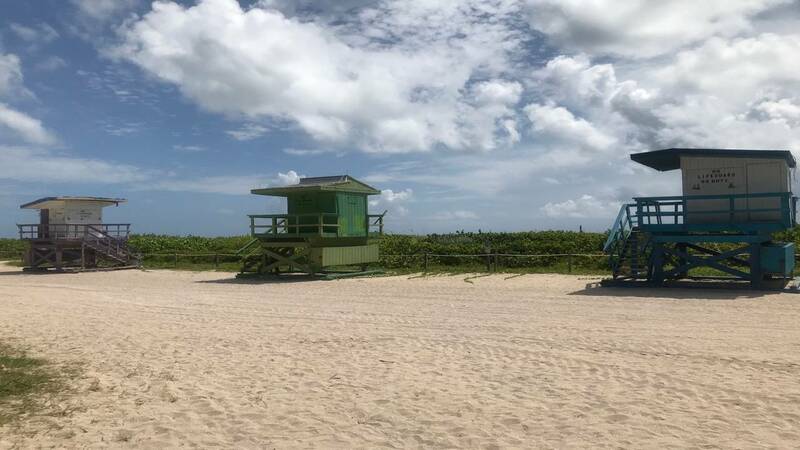 MIAMI BEACH, Fla. - Want to own a lifeguard stand? Now you can. Miami Beach is auctioning off its old lifeguard stands to make way for a new batch. The auction for the six stands is being conducted online at PublicSurplus.com. The stands are all listed from fair to good condition, though one is listed as "cosmetically poor." "The stands currently being auctioned are from the '80s," city spokeswoman Melissa Berthier told Local 10 News. "They are being replaced with newer stands that are more resistant with aluminum hardware and impact windows. With bright, colorful hues, the new lifeguard stands continue to maintain the unique and iconic look that are so beloved locally and internationally." Bidding on the stands was ranging from $100 to $405 as of Wednesday afternoon. These old Miami Beach lifeguard stands are up for auction. If the price tag sounds cheap, there's a catch -- the city won't ship them to the winning bidder. Whoever wins the antiquated wooden stands will have five business days to pay and 10 days to haul them away. Of course, it might be worth it if your children are in need of a new tree house. Or maybe you just really want to take a peek at your neighbor's fenced-in backyard. The auction started Tuesday and ends Aug. 28 at 1 p.m.